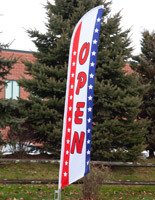 This "OPEN" tear shaped flag is an 11' indoor/outdoor advertising banner with base that will easily attract the attention of customers. 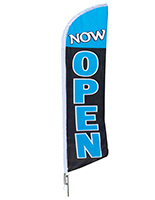 Designed with a cross base for stability, the banner stand includes a fillable water bag for additional security. Each red, white and blue tear shaped flag spells out the word "Open" in bold lettering and features decorative stars to create a patriotic look. The stock message banner is made from durable polyester that will withstand outdoor use. Each 3-color tear shaped flag is designed to alert customers and passers-by to available services. The patriotic tricolor banner's cross base with water bag is ideal for use at both indoor and outdoor locations.